So, I already admitted to being less than pleased with The Unbecoming of Mara Dyer. 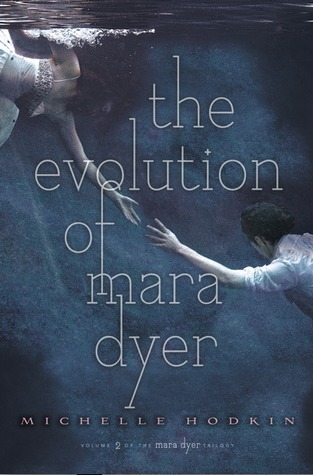 That was kind of a plus because I went in to reading its sequel, The Evolution of Mara Dyer, with much lower expectations. Already knowing the characters and knowing what annoyed me, I was better prepared to be in a zen place while reading this one. It mostly worked. Once again, I didn't love this book, either, but it was still interesting enough to keep me going to the end, and, yeah, I'm guessing I'll read the final book when it comes out, too, just to know what happens. Like the first book, what really kept me hooked were the horror/thriller elements. I'm willing to overlook a lot for a book that does this well, and that's really where Evolution... succeeds. Also, Mara and Noah spend a lot of time apart in this one, not necessarily by choice. That was good because it kept them from getting too shmoopy and kept me from rolling my eyes too much, but it also meant that Mara spent a lot of time pining after him when he was away. There were a lot of things I found problematic in this book, in ways that felt to me like the author was trying too hard to make all of her characters extraordinary and worldly and progressive. Sure, it's great to have a character toss around the word heteronormativity in a YA book, and maybe get curious readers thinking about the concept, but one of my biggest gripes is that no one sounds like a 17- or 18-year old. They all sound like twenty-somethings, and one character in particular whose written journals we see at one point, had me throwing up my hands going no one writes like that. I was a pretentious, probably annoying teenager and still couldn't see myself having the conversations these kids are having. The paranormal element in this book seems to be ratcheted up a few more notches, as Mara begins to experience flashbacks to a life she never lived, but the core emphasis in this book is the psychological thriller aspect. Everyone's convinced that Mara's seeing things, hallucinating, that she's mentally unstable. Everyone but Mara and Noah, at least. That leads to a lot of really chilling moments where even the reader is left wondering what is and isn't real. Mara hasn't been the most reliable of narrators, so it's very easy to start questioning everything that happens. The end of the book begins to unravel the paranormal aspect, sorting out some of the major plotlines but leaving plenty of questions for what will happen next. This is vague to avoid spoilers, but I feel like one of the "aha!" moments at the very end was kind of odd and majorly changes the tone of the first two books in a way that I'm not sure I like. I'll hold out on my feelings on that until the third book, to see how it's resolved. A lot of reviews for this book are also along the lines of "the end of this book punched me in the heart". I am not invested enough in the characters to feel the same way, but if you're in love with Mara and Noah and all the rest, you may have a lot of feelings about things that happen. As with the previous novel, aside from plenty of steamy scenes with Mara and Noah, there are also many scary scenes and violence, including animal cruelty, assault, and self-harm. Although this is a YA book, I would recommend it for older teens and up. I felt similar to the way you did about The Unbecoming... which leads me to think I'll probably feel the same way you did about the 2nd book. It's good to know it had enough draw to get you though to the end--hopefully it will for me to. Thanks for the review!